Bored with the gym? Tired of the treadmill? Want a movement practice that will keep you flexible, strong and energized into old age? 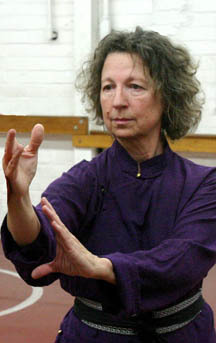 Try our most popular series, Tai Chi for Health. In this 13 week class you will learn a complete, traditional Yang Style set, along with fundamental Tai Chi principles, structure and basics, rich enough to practice for the rest of your life. $65 per month, or $165 (save $30!) if you pay for the full three month class in advance. Taught by Narrye Caldwell, Licensed Acupuncturist, with 30 years Tai Chi experience and over 25 years of clinical and teaching experience. She has a private practice in Santa Cruz and is on the faculty at Five Branches University and the Foundation for Shamanic Studies. Supplemental instruction by Ted Mancuso, Director, Academy of Martial & Internal Arts, with more than 45 years experience. Advance registration is highly recommended for this class, as it often fills early. You can easily register through Paypal below (no Paypal account necessary, you can use any credit card.) Or if you prefer to pay by check or cash, please email me so I can arrange this, by clicking the contact button below.